To skip to Action Plan 5, click here. The word “Camelot” is sometimes used to refer admiringly to a bygone era of potential and promise for the future. 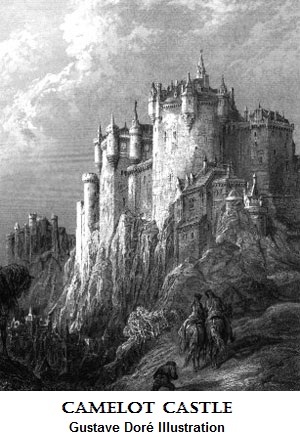 Camelot is a castle and court associated with the legendary King Arthur. Although the subject of many tales for hundreds of years, including blockbuster plays and a film in modern times, its location and authenticity have never been established. In the stage and film versions, the reign of King Arthur and his Knights of the Round Table were brought down by Mordred who sought the throne for himself. Unaware of Mordred’s intentions, King Arthur put Mordred in charge of the knights’ training program. Has a similar fate befallen Scientology? Many Scientologists remember their orgs or mission course rooms and auditing centers filled with students and preclears in the 1970s and 1980s. Now, most of them are empty. To the extent there are students, they are mainly studying “Basics” books and lectures, not training to be auditors. The answer is, yes. Unless we demand of our leaders management based on statistics as given by LRH, and judge them, and the expansion/decline of Scientology, based solely on those statistics, brushing aside all PR, opinion and explanations. The current administration no longer stresses or even publishes these statistics, so the actual progress or decline of Scientology, as defined by LRH, is being hidden. Moreover, it is clear that David Miscavige has altered the statistics used to measure Scientology’s expansion. This has led to such statistics as: (1) # of citizens aware of Human Rights; (2) # of shopping malls playing our Human Rights PSAs (Public Service Announcements); (3) # of people helped. The emphasis of the Miscavige Administration has shifted from LRH’s emphasis on making auditors and the delivery of Scientolgy services to purchasing grand buildings and accumulating wealth, both of which are the result of independent donations, not the income from the delivery of Scientology’s services. “The only reason orgs exist is TO SELL AND DELIVER MATERIALS AND SERVICE TO THE PUBLIC AND GET IN PUBLIC TO SELL AND DELIVER TO. THE OBJECT IS TOTALLY FREED BEINGS! The greatest difference in Scientology when LRH was actively on the lines and during the Miscavige Administration is the current drive for material wealth through the constant hammering of Scientologists for donations at every turn. Buildings, IAS, books for libraries, you name it. Even auditors and staff devote time to “regging” donations! No one can deny the results: a great number of grand buildings, a $1.5 billion (with a “B”) IAS fund and phenomenal book sales. But the orgs are empty (mostly), the books go to libraries that mainly sell them to recyclers for pennies on the dollar, and IAS donations accumulate and are not spent to achieve our main products: trained auditors and well audited preclears. “If the Org slumps…, don’t engage in ‘fund raising’ or ’selling postcards’ or borrowing money. “Just make more income with Scientology. “It’s a sign of very poor management to seek extraordinary solutions for finance outside Scientology. It has always failed. “The proof is in the pudding,” as the saying goes. So, how’s the Miscavige venture working out? To partly answer the question, just LOOK. Go into your local org and mission. How many people are on course training to be an auditor? How many people are receiving auditing, and advancing happily up the grade chart? You can also listen to what some former high-ranking executives, people who saw the stats, have said. We have compiled a list of their relevant comments and statements. Click the button to view them. We offer the statements for what they are, not as the actual statistics. The point is that multiple people who spent many years as trusted executives state that the stats of Scientology: trained auditors, well done auditing hours, active and new members, have been in a continual decline over a 20+ year period. That is reason enough to INVESTIGATE. Compare the evidence with your own, personal observations and you should notice that the two are are consistent. What would LRH do, or expect us to do? Would LRH revolt against the current administration? “So don’t even consider someone with a steadily down statistic as part of the team. Investigate, yes. Try, yes. But if it stays down, don’t fool about. The person is drawing pay and position and privilege for not doing his job and that’s too much reward even there. We don’t propose to slaughter anyone, but we do seek to have the CST Special Directors retain an outside accounting firm to conduct a “performance audit” wholly independent of David Miscavige to determine the LRH statistics of Scientology over the past 25 years and publish them. For those interested in the legal basis for this request, see Legal Stuff. By LRH statistics, we mean the Gross Divisional Statistics (GDS) identified above with an emphasis on the delivery stats of well done auditing hours and trained auditors. 1) Read the Demand for Performance Audit letter to CST Special Directors. 2) Send a letter of support to a law firm retained by us, stating your support for the Performance Audit. EARLIER ACTION STEPS, PLEASE SEND THEM ALSO. 3) Spread the word. Inform other Scientologists you know of the situation by disseminating one-page flyers to them by: A) email, B) regular mail, or by C) simply stuffing the flyers on their windshields or in their mail boxes. The flyers are intended to alert other Scientologists to the situation we are addressing. See “Instructions” below to download the flyer. 1. Download Letter of Support. Add your name or a code name (i.e., an alias or user name) and date it, then mail it to the law firm on the letter. You do not have to provide an address on the envelope if you use a code name. 2. Create evidence. Make a copy of the letter after you fill it out, and keep it on file. This step is especially important for those using a code name. We might need to match the letters to an identity at a later date if and when we need evidence of the amount of support we have – and when people feel more comfortable doing so. The flyer looks best in color and printed as a two-sided, one-page document. If you don’t have the capability to easily do this, we recommend you download the flyer to a flash drive and take it to a nearby Kinkos-type shop. Print it as a black & white, two-page flyer, if you must. Or print this article and distribute it. The idea is to spread the word and involve others. 5. Stay tuned for Action Series 6. The theme of this article is Camelot, and we made a reference to the final scene of the musical, Camelot. Below is a video of that scene. ●Tom of Warwick to those Scientologists courageous and responsible enough to forsake status and fear of consequences and insist that LRH’s command intention be forwarded. Let us be some of the “drops in the great blue motion of the sunlit sea” that sparkle! This entry was posted in Uncategorized and tagged church of scientology, Church of Scientology International, Church of Spiritual Technology, CST special directors, David Miscavige, governance of scientology, Independent Movement, L. Ron Hubbard, Lawrence Heller, LRH, management by LRH statistics, Monique Yingling, Scientology in decline, Sherman Lenske, Stephen Lenske. Bookmark the permalink. Awesome! I really appreciate that you have figured out a way for Scientologists that are still in “good standing” to be able to do something about the current situation without having to defect to a splinter group. I, probably, won’t be in a good standing soon. I found descrepansies with LRH Pls and got no explanations for them. In one mission where I got services I was told (upon my request to clarify is black PR or blackmail or so is an overt) that “it is not an overt that would be taken up in a session”, “this type of situation might be sutable for Ethics write-ups but not for session…” Do you see how creazy it is? SO even if you did black PR against Scn-gy that is not an over any more! I also pointed to a verbal tech. There are a lot of promo that carry some LRH’s cites and HAVE NO references to actual HCOBs or HCO PLs to check the out! I also tried to find out policy IAS operates on… that are from LRH and found none. I’ve pointed to people that IAS has nothing to do with Orgs and their products AT ALL. But was told for all that that “this is your openion…” You see, people are so eager to not-is facts and make them look like “somebody’s openion”. That’s crazy, and I left CoS. All the years (about 13) I was PTS and no advance on the Bridge at all. Now, when I made my decision, I am preparing to audit my family, friends. And if I will audit payed PCs I will price in accordance with LRH’s policy on it and that really makes it affordable for people. Thank you for your site! I am surprised how long I was PTS and did not see what is going on. By the way I am also CL 4, before GAT. The camelot video is a dead link. Well done on your action. Thanks. Video link we used is no longer available, but we found another one for the same scene.